Astronomy Picture of the Day (APOD) | iPhone and iPad app that showcases the largest Astronomy photo library in the Universe. Astronomy Picture of the Day (APOD) for iOS and Android brings the largest collection of astronomy photos in existence to the palm of your hand. 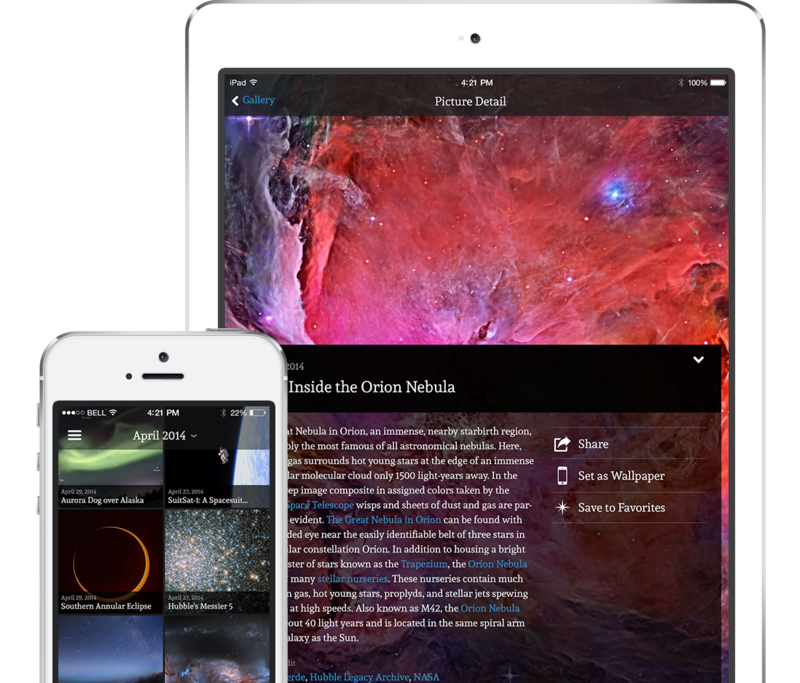 With APOD for iOS and Android you can favorite and share any APOD you choose. Check in daily to see a stunning image of the universe, accompanied by a detailed description. Easily share these out-of-this-World images with your friends on Facebook and Twitter. Find an inspiring image? Mark it as a favorite so you can always find it. Available for free on iPhone and iPad. Available for free on Android phones and tablets. Copyright © 2015 Concentric Sky Inc.